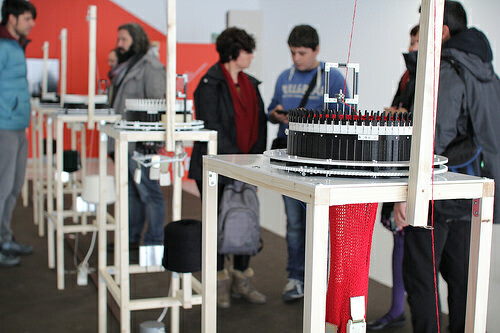 Circular Knitic is an open hardware project created for DOERS, an exhibition curated by Arduino co-founder David Cuartielles, which takes place at Etopia Center for Art & Technology in Zaragoza, Spain. It consists of an exhibition and a series of presentations, workshops and seminars focusing on the world of open creation, invention and personal fabrication. It aims to unveil a variety of extraordinary creations, ideas that are transforming the world, but mostly show visitors a group of people: “the DOERS, constantly looking for new projects that surprise us”. During a period of eight months, 5 knitting machines will be knitting slowly and produce enough tubulars so that the ceiling of the art centre will be covered with knitted scarves. 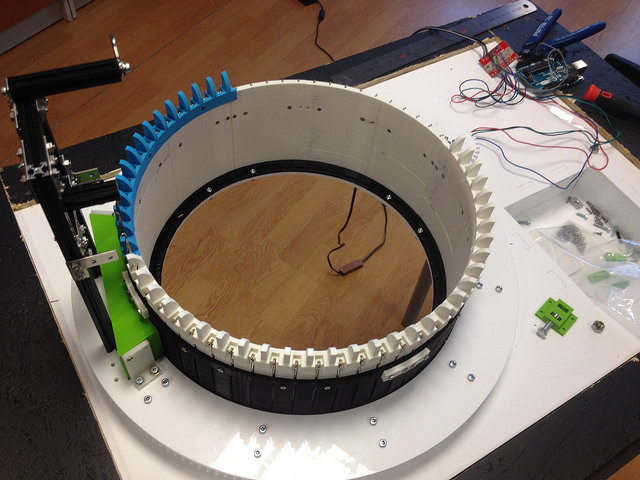 Using digital fabrication and maker tools like 3D printing, laser cutting, makerbeam, and Arduino Uno— Knitic duo designed a replicable circular knitting machine. It’s not the first time they experiment on knitting techniques. A couple of years ago I interviewed them on this blog for their previous project focused on giving a new brain to old knitting machines using Arduino Due. In maker culture, production of textiles is often overlooked. Circular Knitic demonstrates that beautiful textiles can be produced with digital fabrication tools. Most of Circular Knitic parts are made with RepRap 3D printers, some others are made of plexiglass that can be easily lasercut in a fablab. Instructions and all the stl files for the components are available for download on the project’s GitHub page. The videos below shows the building of the machines and when they are in action.